How Much Bee Pollen Should One Take? Bee pollen is the self-produced feed for honeybees. 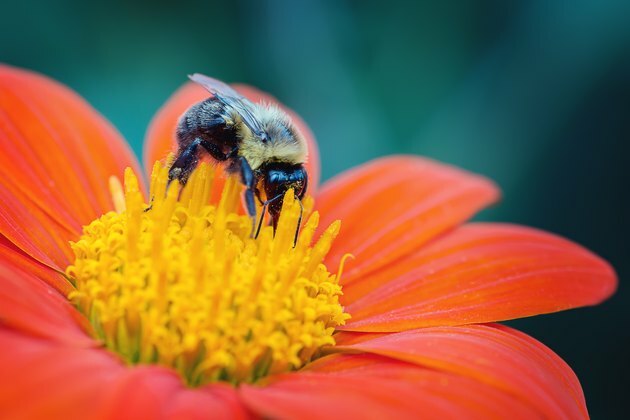 Bee pollen, which is prepared from collected flower pollen, has been declared a “perfect food” because it is purported to be nutritionally well balanced. Manufacturers have advertised bee pollen as treatment for asthma, bronchitis, cancers, peptic ulcers, colitis, various types of infections including hepatitis B, and rheumatism. However, conflicting investigations exist with no clear dosage published in the medical literature. A health care professional should be consulted before using bee pollen for any medical condition. An article appearing in the March 2010 issue of “Pharmaceutical Biology” evaluated the pain reducing, anti-inflammatory, gastroprotective and antioxidant effects of pure honey and a mixture of honey and bee pollen. The researchers found that after three days of successive administration at 500 milligrams per kilogram dose of a mixture of honey and bee pollen, mild gastroprotective actions occurred and significant and anti-inflammatory activities were displayed. However, pure honey did not exert any remarkable benefits as measured by these parameters. The authors concluded that mixing pure honey with bee pollen significantly increased the healing potential of honey and offered further support for its traditional use. Capsules and tablets available on the internet typically contain between 500 to 1000 milligrams of bee pollen and the recommended dosage by most manufacturers is two capsules with 450 to 580 milligrams, taken either three or four times a day. However, no evidence exists in the medical literature to either confirm of refute this amount as studies have not yet been conducted on the therapeutic dosage of bee pollen for any illness. On the contrary, several journal articles appear that detail renal and liver damage from products. The February 2010 issue of “Therapeutic Apheresis and Dialysis” reported on a case of renal failure associated with the ingestion of nutritional supplements containing bee pollen. The article stated that a 49-year-old male patient who had been ingesting a nutritional supplement for more than five months had breathing difficulties, anuria, and exceptional weight gain of 44 pounds due to systemic edema. The doctors involved in the treatment performed a renal biopsy and confirmed drug-induced acute renal failure. They recommended the discontinuation of the nutritional supplement and hemodialysis. The studied noted that current information regarding the adverse effects of bee pollen is not well understood; therefore, potential damage should be considered before consuming nutritional supplements in which it is contained. Recently, a Phoenix-based firm and its owners were fined $200,000 to settle Federal Trade Commission charges that they falsely represented that products containing bee pollen could cause customers to lose weight, alleviate allergy symptoms and reverse aging, among other claims. The FTC also claimed some of the assertions were made in "infomercials" that the company misrepresented to be objective documentary programs instead of advertisements. When ingested, bee pollen does not act as enzymes within the human body as the company stated, because the supplement is digested rather than absorbed, which renders the enzymes useless. Does Bentonite Clay Help with Weight Loss? Is N-Acetyl Cysteine Good for Colds?